Prototype: German Federal Railroad (DB) commuter car, 1st/2nd class (type AB4nb-59). "Silberling / Silver Coin" design. Car no. 32 522 Stg. Model: Era III. The underbody is specific to the type of car. The trucks come with brake shoes. The car is ready for installation of the 66719 lighting kit and the Marklin 73409 marker light kit. The minimum radius for operation is 356 mm / 14. The car has NEM coupler pockets with a close coupler mechanism. Length over the buffers 282 mm / 11-1/8. AC wheel set 4 x 70 0150. The typical Era III DB push/pull train consists of a 23406 car, several 23407 cars, and a 23405 cab control car. 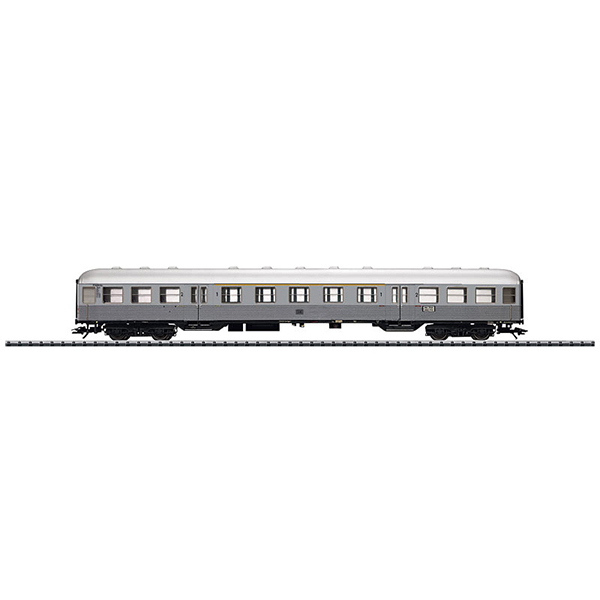 The Silberlinge / Silver Coins cars are available with different car numbers in the Marklin H0 assortment under item nos. 43800, 43810, and 43820. The ideal push/pull locomotive is the class E 41 (item nos. 22140 and 22142 for Trix). Prototype: German Federal Railroad (DB) cab control car, 2nd class with a baggage area (type BD4nf-59). "Silberling / Silver Coin" design. "Rabbit Hutch" end with the baggage area and a rubber diaphragm. Car no. 96 385 Stg.